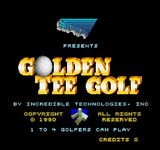 This is the first of the storied Golden Tee Golf game series. It starts with humble roots. This version is 2d. Only looking from behind the golfer. It still features 3 courses with varying tee shots. Games are played through 18 holes if you put in the quarters (1 for 3 holes of golf). Graphics were lackluster (very blocky).